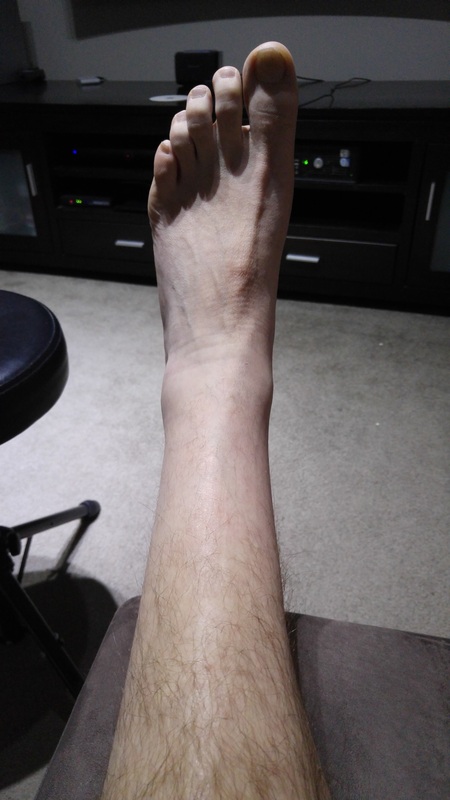 Matts Arghhhcilles Non-Operative Tendon Rupture Blog — The tale of the Tendon that delayed an overseas trip! The tale of the Tendon that delayed an overseas trip! 17 weeks post Rupture - Life getting back to normal! It has been a while since I posted here and I thought I would post an update on my achilles healing. I am now 17 weeks after my achilles rupture and I went the non surgical route. As I was unable to do a single calf raise at my last appointment (21/10) My physio changed my exercises to try and get back the muscles around the ankle to help with that. Good news is that only after a few short days of doing eccentric calf raises (Hold for 5 seconds each time) I am now able to bounce to a single calf raise and last night after completing all my exercises (13 of them) I was able to do a single calf raise without bouncing, was only about 10mm-15mm off the ground but was definitely a single calf raise and it caused no strain to the tendon at all. I attempted to do it this morning not long after I got up but I was not able to do it, so its not perfect and I need to be warmed up but I feel heaps better. I am slowly climbing my Mt Everest! I am also only needing to see the Physio every 4 weeks now and I do not need to see my surgeon again unless I feel I am not able to get back to normal, but at the last appointment he said he is very happy with my healing and was confident I would not need any surgery to fix my tendon due to lengthening. 10 week update - Nothing much to report! I am currently 10 weeks and a day after my rupture and all is going well. I survived my US trip and the achilles did not slow me down or inhibit me as much as I thought it would. I am no longer using my boot and walking around in 2 shoes and that is great, my walking speed is also not too bad and I feel like I am at a stage now where it is a normal injury. I have had plenty of injuries in the past and you just get on with life with some pain or a limp or some other impairment. In the early stages of an achilles rupture if feels so much worse than a normal injury, now I feel like it is just a normal injury and I am able to get on with my day with only slight interruption. 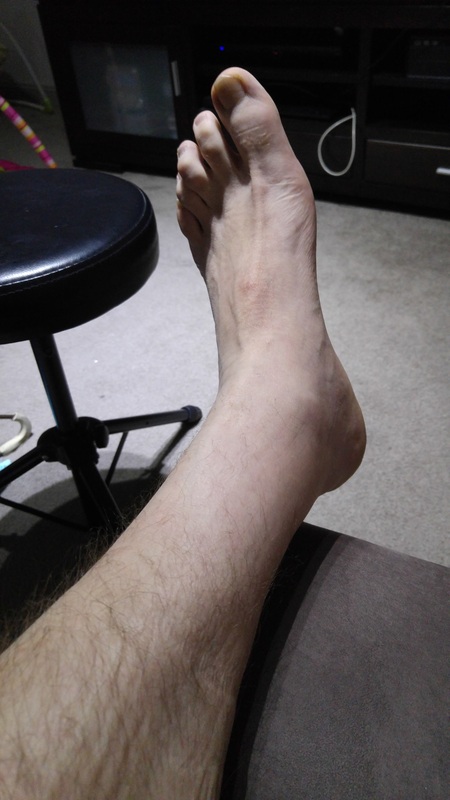 I have been given a new exercise to do:- I roll up a towel and place my foot on it and bring my straight leg over the top stretching the achilles and also loosening the other ankle muscles. I have to do 5 x 30 seconds. It makes my walk so much easier after I have done it. I am back to see my OS on Wednesday 9/9/15 and will report what he has to say then! I was wondering if I could get some feedback from peoples experiences when starting to walk normally and getting back to normal movement. I am ok walking in 2 shoes now and for the most part it is pain free but I have tightness in my ankle that seems to restrict movement. I don’t get any pain in the tendon but the tightness restricts movement and I was wondering what people have done to loosen it up. I cannot put my finger on where the tightness is really, but if feels like it is around the ankle bones either side. Will it just loosen up with more walking and physio and is it common? Walking heaps in Hawaii. Doing quite well. Quick question?? I have been in Hawaii since Saturday and have done loads of walking since I’ve been here. Yesterday I did over 8000 steps and overall it’s quite good. My shoe is rubbing though on my heel as my ankle is still swollen but not massively. I can walk about 75% normally bare foot but walk worse in shoes. My question is did people find the back of the ankle gets sore to the touch? The tendon itself is not sore, it’s the outside and it could be to do with the shoes but I was wondering if anyone else had encountered the same issues when going to 2 shoes. Wore 2 shoes all day yesterday while out in the world! Did my first one legged heel lift as well! I decided yesterday to try and go out wearing 2 shoes. I went to a local shopping centre which I am very familiar with and knew was not very busy, I went there and had lunch and then went and did a little grocery shopping with my wife. It went well and I felt no pain but I was guarding my achilles by the way I was walking and it did make my shins and the front of my foot/ankle ache somewhat. The physio told me that shin splints and bad news are often a bi-product of incorrect walking after an achilles injury and that I should walk a little less until I am able to do multiple one legged heel lifts with my bad leg. In the afternoon I did my hydrotherapy and was actually able to do my first one legged heel lift if the water was about shoulder height, and waist height I was still unable to do one. I was also started with a resistance band and need to do 3 reps of 10 x 5 seconds to strengthen the ankle area. I cannot see much changing in the next few weeks as I will be overseas and will not see my OS or Physio but I have plenty of exercises to keep me going while I am away and will hopefully be all good when I get back. 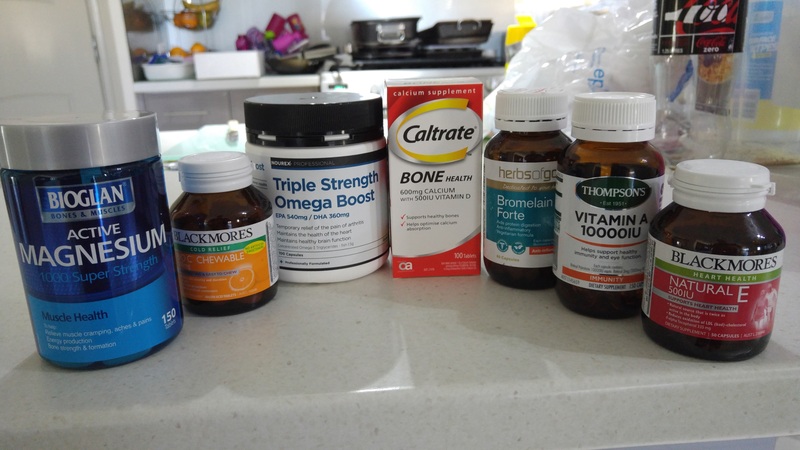 Vitamins and supplements are go! I want to try and do what ever I can to help heal the tendon but also improve muscles and bones in my body overall! Lump on rupture point seems larger after full weight bearing, is this normal? I have an appointment tomorrow with the physio and will check with her then but I have always been able to get accurate and timely answers from people here who have gone through it themselves. My rupture point has always had a lump on it and I asked about that at the time and was advised it was normal and probably scar tissue or similar. I have started full weight bearing this week and am also not wearing my boot when I am at home for the last 3 days and I have also slept without the boot for the first time last night. I feel no pain when walking (Some tightness in the ankle) but I noticed that the lump on the rupture point seems larger than it was. Even though I am in no pain when walking I do get the odd twinge when I am stationary funnily enough and was wondering if that is normal. I actually feel better now when I am bootless as the boot seems to irritate my leg more than it used to. What were some of the issues and challenges others went through when they started using the injured leg without the boot? Two shoes at 5 weeks? Bare foot walking. I went to see my OS yesterday and he checked my tendon and then asked me to walk back and forth bare footed. I was limping and he kept telling me to walk normally, but I was too nervous to try it. He was happy with my tendons healing and said that I would be OK to go back to 2 shoes. I felt it was too soon and so did my Physio so I am going to wear the boot while overseas but I have been given exercises to do whilst in a pool. I have to do 5 minutes of walking in chest high water, followed by heel lifts and then finally balancing on my bad leg only to strengthen it. I did these exercise fully weight bearing yesterday as well and when I put my full weight on my bad ankle, it was quite painful, so that is why we decided to wait until my calf is stronger and my Achilles has healed for a few weeks longer before going back to 2 shoes. When I’m walking around the hotel I will try 2 shoes to practice and I walked around last night at home in 2 shoes to make me feel normal again for a short time. I need to get out of the mindset that I need the boot 100% of the time, but as I’m getting around OK now its hard to push to the next step and risk rerupturing my tendon. I’ll get past this but am feeling good about my current healing. I was out and about all day today and did not use any crutches at all. It was the first full day that I did not use any crutches and walked around all day. I did nearly 2000 steps and my ankle is not even swollen. I am back tomorrow to the physio and the OS to try on the MTB shoes but I am leaning towards just getting a half size cam boot for the extra protection. 4 Week Appointment - 0 Degrees is so cool! Went to see to the OS this morning and he is very happy with my healing so far, the tendon is nicely joined and my range of movement is very good for this time in my healing. He has asked that I purchase a MBT shoe for when I am in the US and I was wondering if anyone had any feedback on them, reading reviews on the net showing pretty much nothing but positive feedback but are not for achilles specifically. I need to buy some this week and do a test run next week for the surgeon with a view to wearing them while in the US to aid my getting around easier. I also saw my Phyio and my boot was put to neutral! Who would have thought that freezing temperature (0°) would be something I wanted to get to! Ha… I have found it much easier to walk with the boot at neutral as well so that is helpful. I am pretty much WBAT at home and still using the crutches in the big bad world! I was also given some extra exercises to do to try and build up my calf muscle as my good calf is 39cm’s and my bad calf is 36cm’s. I have to stand bare footed while holding on to a steady surface and swap my weight back and forth from my good leg to my bad leg.